Why do People Choose Composite Timber Over Natural Timber? There are many reasons why homeowners, renovators and tradespeople are opting for natural look timber composites over harvested timbers. 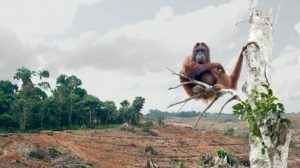 They want to save forests. They want to save orangutans whose homes are harvested to provide us with Merbau decking. They want to minimize waste plastic going into landfill or clogging up our oceans. They don’t want to deal with ongoing deck maintenance as needed with natural timber, i.e. sanding, oiling, re-sealing, painting. They want long lasting, value for money. They want a timber-look deck without the splinters or protruding nails. They want a timber-look deck that doesn’t warp or cup. They want a timber-look deck that is UV, fade, stain and mould resistant. They want a timber-look deck that won’t be attacked by termites. And in Australia, many want a timber-look deck with a high BAL fire rating. But not all timber composites are created equal and the price is not always a good indicator. One way you can differentiate is to check the warranty offered. Then ask yourself, would you be happy with a 7 or 10-year warranty, or would you be more comfortable with a 25-year warranty? NewTechWood, which prides itself on a quality product, maintains a rigid Quality Assurance process before the product is even allowed to leave the factory. This enables them to offer a 25-year warranty with confidence. Top quality timber composites are made from a combination of high-density, recycled plastics and wood fibres, formed into a variety of colours and natural-looking wood hues. This results in composite decking like NewTechWood that is low maintenance provides lasting durability, is capped fully around all four sides of the board, and has a BAL29 fire rating. Most composite deck board manufacturers offer only solid core boards, due to the speed and ease in manufacturing those boards versus manufacturing hollow boards. But when NewTechWood moved their factory from the U.S. to China, they made sure being able to still provide both options was a viable and successful process. The NewTechWood ‘Metro’ decking board is a circular hollow core timber composite that is ideal for residential decking on joist spans no larger than 350mm. Hollow core composite is lighter in weight, and thus less expensive than the solid board, but is still appropriate for all Australian climate and weather conditions. Hollow board cuts down the weight of a 4.8m board by as much as 32% or 4.5kgs when compared to a solid board. This makes them easier to work with. Hollow boards are easy to install and built to last, and contrary to the fear that being hollow is somehow inferior to a solid board, while these boards do use less material, they are actually crafted scientifically for strength. Would they offer a 25-year warranty on an “inferior” product? The fact is the strength of the arch structure of the voids in NewTechWood hollow boards makes up for the use of less material in the core. As for the ‘holes’ showing at the ends of the boards, they have end caps designed to finish the boards and thus no holes are visible. The NewTechWood XL range is designed for commercial, heavy duty use, and is also used in residential situations where deck joist spans are a minimum of 450mm. These solid boards naturally are heavier and slightly more expensive than the hollow range. The XL range is also useful when replacing an older timber deck where the existing sub-frame is already based on joist spacings of 450mm. However, as with the hollow board, the solid range is easy to install and durable, and of course, you have peace of mind with that 25-year Warranty. 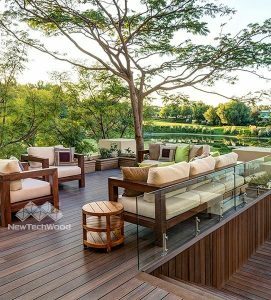 Composite decking, like NewTechWood, offers a high quality, competitively affordable timber decking alternative that ticks all the boxes on a personal level as well as environmentally, which is why more people are choosing composite over natural timber. Find out where to buy NewTechWood from our trusted suppliers around Australia or visit a display centre. Hollow Boards vs Solid Boards – what are the pros and cons?